Send gifts to Philippines. send fruits to Philippines. Free delivery. Cheap price. 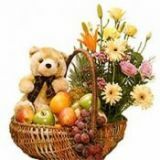 This winsome wicker basket is filled with the very best freshest local fruits and carefully hand-picked and hand-inspected exotic ones including Extra sweet sweet mango, selection of crisp sweet apples, crunchy red and green seedless grapes. All of these and a bottle of premium white wine with a large plush teddy! What ever your message is this combo will say it all. Whatever message you have, our gift tray will convey in a delicious, nutritious and spectacular way. Your purchase includes Free Classy Greetings Card. Order now! �Philhearts is committed to ensure fastest Same Day Delivery in the industry. So when you place your order with us you can be assured that your basket(s) will be delivered right in time. �All our gift baskets are hand packed and never mass produced. In case of provincial delivery, basket might not be included. �Our cut off time is 10 Am Local. Orders received after cut off time will be delivered on the following day. We deliver 7 days a week including holidays.